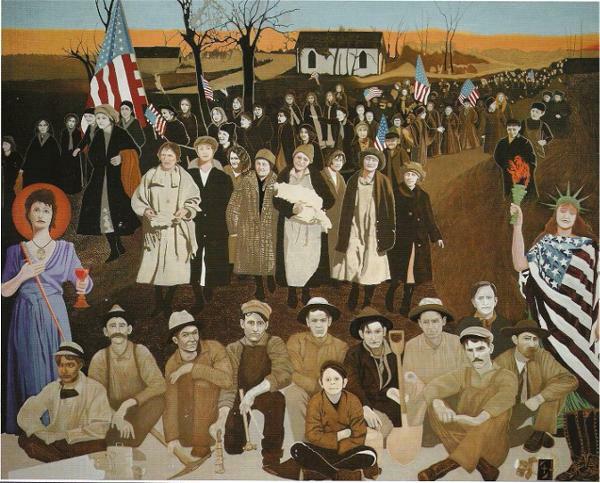 This painting, based on historic photographs, depicts coal miners of Southeast Kansas and the women who marched to support their rights, in the winter of 1921. At that time Kansas was third in production of coal. The strike by the miners, and the march by their women made national headlines. The artist and others from the community, identified many of the real people who made this history happen, and interviewed descendants of this history and added their portraits from family albums to the historic photos. In the painting, on either side of the coal miners stand two ladies, whose spirit inspired and protected them. St Barbara stands on the left side of the painting. She is patron saint of coal miners, and all those in danger of sudden death. On the right, stands the Statue of Liberty; she was the first sight of America for many of the immigrants coming here from eastern Europe during and after World War I. They did not forget the promise she offered them. Some immigrants came directly from Ellis Island to the Southeast Kansas coal mines. They found a hard life, dark and dangerous conditions in the mines. Their local union leader, Howat, worked hard to make their life better. He called the strike to get fair wages. When he was jailed the issue became the right to strike. His men stayed on strike and when it seemed nothing would work, their women marched. This labor struggle was nationally significant, and helped win the right to strike. This painting is currently on exhibit at the Pittsburg, Kansas Public Library. Prints of the painting are available from the artist or at the Pittsburg, Kansas Public Library.